In Cleaning up the Studio, Christian Jankowski talks about one of the founders of video art, Nam June Paik, who passed away in 2006. The native-born Korean lived and worked in New York. Shortly before his death, he sold his Manhattan studio as an installation to the Nam June Paik Art Center in Korea. After his death, it was dismantled, shipped, and reconstructed in the Korean museum. In 2010, Christian Jankowski is invited to the Nam June Paik Art Center. This is where he sees the untidy studio for the first time. He hires a cleaning company "Beautiful Cleaning", a company name that clearly evidenced professional ambitions and aesthetic pretensions. 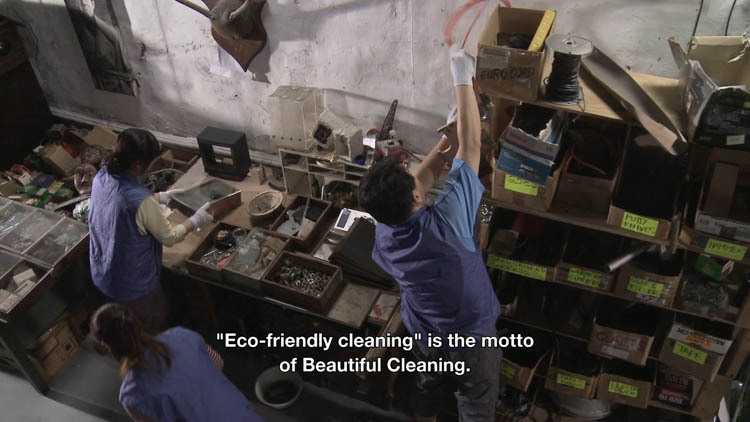 According to the contract, the cleaning company is engaged to tidy up the dead video artist's studio – following all the rules of its profession. Tins, tools, and monitors are cleaned, sorted according to size and stowed away to save space. At the end, everything is in order but the studio is silent; it no longer speaks to us. The traces of artistic work have been eradicated. Questions on the borderline between a body of work and the terms of its production arise.